The worst may be over for people living near what has been the noisiest phase of the Purple Line's construction. With basic tunnel work moving into a final phase, Purple Line Transit Partners says residents near the future light rail line can now expect less nighttime noise. People living near what has been the noisiest Purple Line construction so far can expect less nighttime noise now that basic tunnel work is moving into a final phase. “The noisy part is largely over,” Purple Line Transit Partners CEO Fred Craig said. 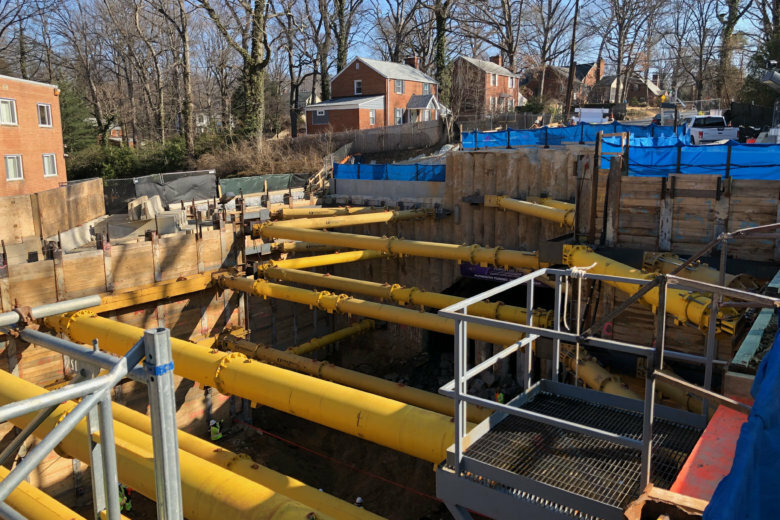 The outlines of the tunnel in Silver Spring from Arliss Street under Flower Avenue to Wayne Avenue are now complete, and the private group building the Purple Line says work has now shifted to installing mechanical and ventilation systems and the permanent tunnel lining. The top half of the tunnel broke through in December. The bottom half broke through last month. Still, Craig says work is expected to continue in the area between 7 a.m. and 11:30 p.m.
“If you let any part of this job lag, there will be problems later on,” Craig told the Montgomery County Council Thursday. People who live near the tunnel got to raise their concerns with project leaders Thursday night. “The excavation is complete, but the lining and the systems are not done yet. There’s a lot of work to do,” Craig said. That includes truck traffic, concrete mixing and some dirt excavation near the end of the tunnel. Purple Line leaders still hope to be able to open the line by the end of 2022. Other work is ramping up along the entire 16-mile corridor between New Carrollton and Bethesda. A railcar testing and maintenance facility near Veterans’ Parkway is among the next major milestones, since it must be completed for initial testing of the railcars in Maryland to begin as soon as next year. Blasting is also scheduled to continue in Bethesda, where a 190-foot deep shaft connecting a new second entrance to the Metro station there is under construction. The framing of the future Bethesda station being built under a future high rise next to the shaft is also progressing, and is ahead of schedule, Craig said.